What is Sage CRM (Customer Relationship Management)? Manage and maintain strong customer and prospect relationships. Effectively manage and track support calls and customer issues. Track sales opportunities and pipeline. Generate and manage leads through better marketing. Access relevant accounting information from within Sage 200. Post sales invoices from Sage 200 CRM to the core accounting solution. What are the top benefits of Sage 200 CRM? Allows you to have a centralised customer and contact database that is shared across your organisation. Sage 200 CRM is easy to customise, so it fits the way your business works. CRM has great user adoption because it’s easy to use and intuitive. Has a low cost of ownership that creates value for your organisation. Provides a secure database that looks after your customer and prospect data. Advanced mobile features so mobile workers have access to Sage 200 data whilst in the field. Provides effective productivity tools to improve employee performance. Sage CRM helps drive sales and lead generation. It is well tested and comes from one of the worlds most renowned software developers Sage. Plenty of apps to add and great integration with accounts. Sage 200 CRM is based on Sage CRM which is one of the most powerful CRM solutions available. Sage 200 CRM links with Sage 200 so you have full integration between sales and accounts. What are the key Modules in Sage 200 CRM. There are 3 Modules in Sage 200 CRM, these are Sales, Marketing and Support, we have listed below some of the key features in each module. The Sales Module handles everything from leads and customer management to pipeline reporting, it provides the necessary tools for sales people to work effectively and drive revenue into the business. 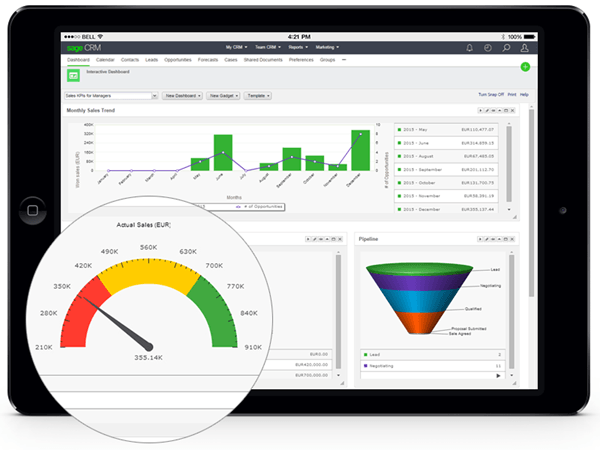 Sage 200 CRM provides accurate Sales Reporting and Forecasting to speed up sales and avoid losing key opportunities. Track emails, documents and quotes with tight integration with Microsoft Outlook, so all correspondence with customers are stored in a central location. CRM allows you to build strong relationships with prospects and customers by allowing you to manage all interactions, so you have a 360-degree view. Advanced mobile technology allows sales to be in touch with customers on smartphones, tablets and working remotely over the internet. Smart territory management has some great features, such as workflows that automatically send leads to sales people by region. Track customer interactions, which includes phone calls, meetings, documents and to-dos, you can also manage timely follow ups to make sure each account is correctly managed. Upsell and cross sell to existing clients. The Marketing Module in Sage 200 CRM has a range of advanced features that helps you implement and track marketing campaigns, so you can drive leads into sales revenue. Advanced campaign management – Sage 200 CRM provides a set of tools for you to manage all aspects of delivering campaigns, whilst providing detailed tracking on each stage of the campaign as well as conversion rates. Email campaigns – the system allows you to send out sophisticated email campaigns and works with many commonly used email platforms. Setup groups for customers and prospects so you can focus campaigns on specific data, you can also export data to external mailing houses or agencies. You can setup groups across a wide range of criteria, i.e. industry type or location. Telemarketing call management – you can use Sage 200 CRM to manage all aspects of outbound call management for sales and telemarketing campaigns. Detailed dashboards and reports allow you to track lead generation campaigns throughout the whole cycle of the campaign. Track leads throughout each of their stages and highlight leads that have gone cold or have not been actioned. Case and Support Ticket Management – You can log and track customer support cases with customers that are logged in Sage 200 CRM, this allows your support staff to keep track of issues for quick resolution. Advanced Knowledge Base – you can record and build a knowledge base of common problems and issues, so your support or customer service staff can access solutions to various issues. Self-Service Portal – Sage 200 CRM gives customers access to a portal to log service requests and technical issues. Reporting and Dashboards – there are a wide range of dashboards and reports in Sage 200 CRM where you can monitor support tickets and cases which is great for review or management meetings. Follow ups and activities – Sage 200 CRM has a wide range of scheduling tools, so you can schedule calls and meetings, you can have all documents and emails attached for reference against a specific customer or support ticket. Web Self-Service – the system has an advanced web self service feature that allows you to link to your website, so support tickets can be logged from your website and then this will appear as actioned in Sage 200 CRM. Ticket Escalation – If you have predefined SLA’s with customers you can setup escalation procedures. With this feature, if a ticket has not been resolved within a certain time, Sage 200 CRM can send an email notification to a manager alerting them that the problem has yet to be resolved. Ticket Tracking and Management – this feature dates and time stamps each support ticket enabling you to manage each ticket. What features are in the Sage 200 CRM to Sage 200 Accounts Integration. Create a quote in Sage 200 CRM which can then be pushed through to Sage 200 Commercials or Financials. Sales people or front office staff can create Sales Orders in Sage 200 CRM which is then processed through to the core sage 200 accounting suite, avoiding duplication. Front office users of Sage 200 CRM can see account balances, if a company is on hold as well as live stock balances. Users can convert quotes into Sales Orders from Sage 200 CRM which is then posted over the accounts system. Data between the two systems is synchronised so you have up to date relevant information. Download the Sage 200 CRM to Sage 200 integration guide. What are the costs of Sage 200 CRM? Sage 200 CRM is available for the on-premise version and the subscription pricing model, it is currently not available for Sage 200 online. The on-premise costs are £800 per concurrent user and £450 per named used. The subscription price is on a monthly cost per user, the concurrent user is £22.50 per year per month and a named user is £15 per user per month. On top of the cost of the licence you need to factor in the integration and installation costs, as well as training costs. Call AlphaLogix for a quote or demo of Sage 200 CRM on 0845 257 3141 or email us at sales@alphalogix.co.uk to discuss your CRM requirements.